Team members Rudi Fasan, associate professor of chemistry; Danielle Benoit, associate professor of biomedical engineering; and Benjamin Frisch, research assistant professor of hematology and oncology, are supported by a $75,000University Research Award. The award program is one of several University “seed grants” (see also PumpPrimer II awards below) that help investigators develop preliminary data and proof of concept for promising projects, in hopes of leveraging larger awards from federal agencies or foundations to carry the projects to fruition. The low survival rates for AML, especially among older patients, and the limited treatment options when the disease relapses constitute “one of the major challenges in leukemia,” Fasan says. Even after the bulk of active leukemia cells in the bloodstream are destroyed by an initial round of chemotherapy, he says, a “quiescent” subpopulation of leukemia stem cells often survives in the bone marrow. When the stem cells enable the cancer to repopulate during a relapse, the newly emerged cancer is often more aggressive and more resistant to treatment. “What is important is to be able not only to target leukemia cells selectively, but also to eradicate cancer stem cells as well,” Fasan says. He believes the researchers and labs collaborating on the project are particularly well suited to take on the challenge, bringing to bear expertise in organic and medicinal chemistry (Fasan), drug delivery technologies (Benoit), and the physiopathology of bone marrow during myeloid malignancy (Frisch). For example, Fasan’s lab has worked for several years with chemical compounds extracted from plants, further refining them as anticancer agents. One such compound is micheliolide, derived from a naturally occurring chemical that makes magnolia leaves unpalatable to insects. Using a combination of engineered enzymes and chemical methods, Fasan’s lab has further modified micheliolide to develop analogs – or variants – with improved activity against both active leukemia cells and leukemia stem cells. “We can generate entire libraries of this compound,” says Fasan. His team is working with Frisch on testing which analogs are most effective, and at which doses, when applied to an acute myeloid leukemia cell line used in the Frisch lab. This illustration from the Benoit lab shows how it forms nanoparticle drug delivery vehicles. Polymers containing both hydrophilic (water attracting) and hydrophobic (water repelling) portions are synthesized. When the polymers are introduced to a water-based solvent, the particles form nanometer-sized micelles (nanoparticles). Drugs are loaded into the micelles, and targeting moieties selected to target bone marrow are conjugated to the outside, to provide preferential drug delivery to marrow-resident stem cells. Benoit’s lab, in the meantime, has been developing polymer nanoparticles as vehicles for delivering chemotherapeutic drugs to specific parts of the body where a disease occurs, in order to minimize damage to healthy tissues. Her lab recently augmented the nanoparticles with a peptide that can help steer the drug vehicles specifically to bone marrow. The peptide binds to the TRAP enzyme that is released when diseased or worn bone tissue is broken down by osteoclasts during the body’s ongoing process of bone remodeling. The remodeling activity is especially prevalent in the marrow of leukemia patients. 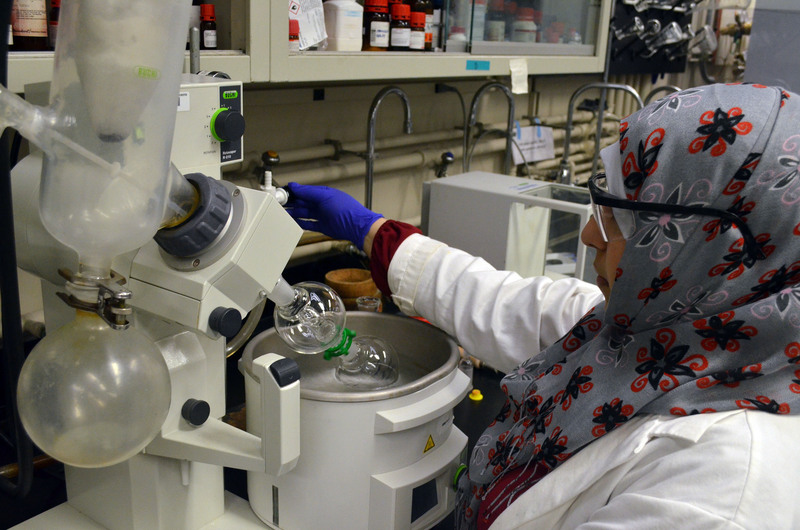 Preliminary studies show that the nanoparticles accumulate at a significantly higher rate in TRAP-positive bone tissue than other tissues, and can efficiently load and then gradually release a chemical compound similar to the one Fasan’s lab has developed. Benoit’s lab will further test how the nanoparticles perform when loaded with analogs of Fasan’s compound, and adjust the nanoparticles accordingly. Eventually, the two to three most promising nanoparticle-analog combinations will be tested on mice models that replicate AML in Frisch’s lab. The award will support graduate students working on the project, and also help offset other costs, such as producing sufficient quantities of the compound analogs, optimization of the nanoparticle delivery system, and the cost of the mice used to model leukemia. The program “is a great way to get some seed funding and to develop the preliminary data that will make you more competitive for NIH funding,” Benoit says. Frisch concurs. This work was published in UR Research Connections, and Newscenter.